The Sunflower River (aka The Big Sunflower River) flows down through the flat western Mississippi delta bottomland, paralleling the Mississippi River and only separated by that granddaddy of all rivers by a few miles on average. It’s a region rich in history, one of the birthplaces of the blues, with a who’s who of legendary players calling the area home through the years. 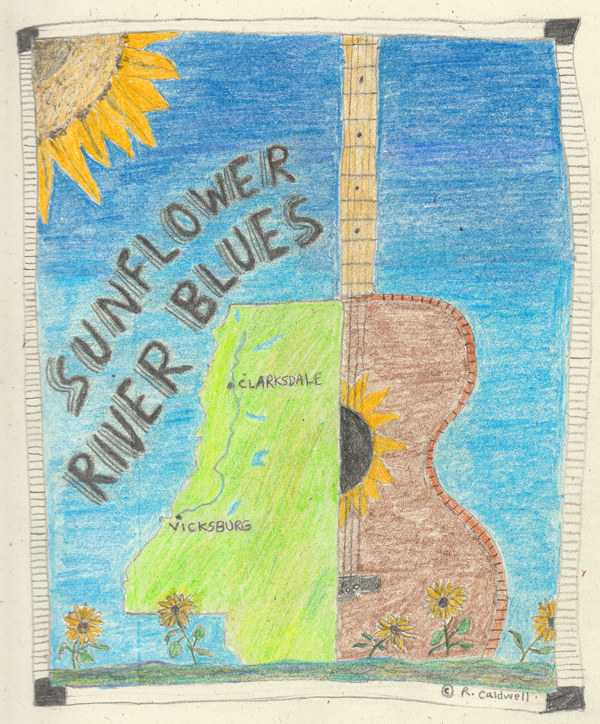 Clarksdale, near the top of the river, is home to the annual Sunflower River Blues and Gospel Festival and is home to the Delta Blues Museum. Indianola was B.B. King’s hometown, with his album Indianola Mississippi Seeds named for it. It’s said that Muddy Waters was named for the muddy Deer Creek, a sometime tributary of the Sunflower (when the rain’s heavy enough). And the Sunflower River is just as muddy, the result of natural silt and dirt from neighboring streams and bayous. Unfortunately, despite its historical and ecological importance, the Sunflower River has been named the most endangered river in the United States, due to a proposed Army Corps of Engineers project which could devastate the river and adjacent wetlands wildlife. A whole ‘nother kinda blues. One of “American Primitive” guitarist John Fahey‘s most evocative songs was “Sunflower River Blues,” first heard on his 1963 Death Chants, Breakdowns and Military Waltzes, later re-recorded in a slightly more liquid and smooth version on the eponymously titled John Fahey / Leo Kottke / Peter Lang (1974). Though Fahey was from Maryland, he was in tune with the music of the Sunflower River – with the music of the old blues players who grew up there and with the rolling and drifting river itself. The song works from it’s title on down. “Sunflower River Blues”…. it just rolls off the tongue and feels good and sounds good to say those words together. Redolent of golden brightness as well as verdant and mysterious depth. Fahey’s playing is exploratory at first, a river’s source beginning to find a path through the land. Soon it locks into a flow and direction, free and easy, picking up more rich mud, more history, past cotton fields and farms, steamy forests and swamps a million shades of green, dusty back roads, small towns, and yes, the occasional sunflower as well. All beneath a hot summer sky, towering cloud pillars on the distant horizon. Somehow I’d never heard of the Sunflower River before. And I’m a fan of the blues musicians who came from that area. Thanks, I had never heard of it either but was intrigued by the song to see where the river was!